Cleared 1 stage in the Althur City area. Cleared 10 stages in the Althur City area, or earned 40 Stage Rating Stars. Cleared 10 stages in the Ecleon Ruins area, or earned 40 Stage Rating Stars. Cleared 10 stages in the Lanx Mountains area, or earned 40 Stage Rating Stars. Cleared Stage 15 in the Althur City area. Cleared Stage 15 in the Ecleon Ruins area. Cleared Stage 15 in the Lanx Mountains area. Cleared Stage 15 in the Arion Island area. Cleared Stage 15 in the Underworld area. 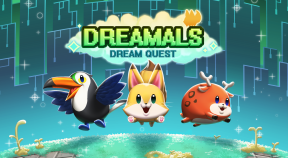 Watched Dreamals: Dream Quest - first ending cutscene. Cleared all the secret stages in the Althur City area. Cleared all the secret stages in the Ecleon Ruins area. Cleared all the secret stages in the Lanx Mountains area. Cleared all the secret stages in the Arion Island area. Cleared all the secret stages in the Underworld area. Cleared all the secret stages in the Moon area. Watched Dreamals: Dream Quest - second ending cutscene. Earned at least 90 Stage Rating Stars. Earned at least 190 Stage Rating Stars. Earned at least 290 Stage Rating Stars. Earned at least 390 Stage Rating Stars. Earned at least 490 Stage Rating Stars.